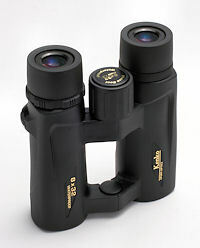 Kenko is a Japanese optics company that makes a full line of photographic equipment, but also manufactures a large number of binoculars and spotting scopes. This is not a new company, having been around since 1957, but Kenko is unknown to most people except optics business insiders. Kenko has manufactured optics for other companies to rebrand and market, including some big name companies. However, until recently, they had no distributors in the U.S for selling their own brand. Obviously that has changed and it gave us something nice to write about: the ultraVIEW EX binoculars. The ultraVIEW EX line is comprised of 6 different binoculars, all of which are roof prism designs. There are two 50-mm binoculars at 10x and 12x magnification, standard full-sized 8x42 and 10x42 models, and two mid-sized versions at 8x32 and 10x32. We happen to be big fans of the 8x32 ultraVIEW EX, which offers a great combination of brilliant optics, low weight and other features at the very affordable price of $239.00, and is the subject of this review. As roof prism binoculars, the 8x32 ultraVIEWs are fully sealed and nitrogen-purged to be waterproof, dust-proof and internally fog-proof. Additionally, the 8x32 ultraVIEWs have an open bridge design, with space between the hinges for 2-3 fingers, providing a stable, comfortable grip. The Kenko ultraVIEW 8x32 is about average sized at 5.8 inches tall (5.4 inches with eyecups down) and 5.75 inches wide with the hinges fully open. Despite that, they are feather light at exactly 16 oz., due to their fiberglass-reinforced polycarbonate frame. One question we get asked a lot about 32-mm binoculars is, are they as bright as full-sized 42-mm binoculars? It’s actually a surprisingly difficult question. With less surface area, a 32-mm lens has less light-gathering capacity, plain and simple, but that isn’t the whole story. The question is: how much of the light that the lens gathers is actually transmitted to your eyes? This becomes a question of efficiency of the optical design, and it’s where really good binoculars excel and poorer ones fall down. A well-designed 32-mm binocular can be brighter than a low-quality 42-mm binocular. Kenko ultraVIEW EX binoculars are definitely a case of a well-designed binocular. They have fully multi-coated lenses for maximum light transmission and brightness. They are phase-coated for greater image sharpness and more vibrant color. For those of you to whom it matters, the 8x32 ultraVIEWs are made with lead- and arsenic-free Eco-friendly glass. The focus knob is unusually large and turns with great ease. The 8x32 EX binocular has a minimum close focus (MCF) of 8.8 feet which they achieve without field collapse. The 8x32 ultraVIEWs go from MCF to infinity in a zippy 1.25 turns of the knob, meaning you won’t have any trouble keeping moving targets in focus. The field of view at 1000 yards is a huge 420 feet, well above average for an 8x32 design. We noticed that the ultraVIEWs have very little chromatic aberration of any kind at any point in the field, resulting in particularly clean and sharp images. The 8x32 ultraVIEWs have 17.5 mm of eye relief, more than enough to accommodate most eyeglass wearers. The interpupillary distance range on these binoculars is 56-76 mm, which means you won’t have difficulty finding a comfortable setting to fit your face. The eyecups adjust with a helical twist mechanism with three detents between fully-in and fully-out, so again, finding a comfortable setting is easily achieved. The diopter adjustment is a very simple twist ring on the upper right barrel. The rainguard is a single hard plastic piece that fits semi-loosely over the ocular lenses; it has a bracket for fitting the strap through to prevent loss when carrying it into the field. The objective lens covers are a one-piece design, fitting directly into the ends of the barrels and linked by a flexible bridge between them. The case is a waterproof nylon-cordura affair with a Velcro closure on the flap. 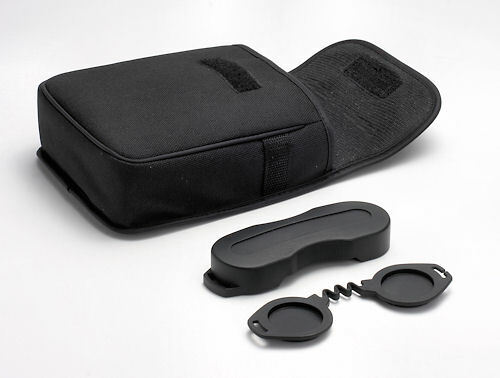 The unpadded nylon strap is plenty comfortable enough on a binocular this light. To our disappointment, Kenko has stopped making binoculars. This model is out of stock and no longer available. Please contact us for alternatives.